Most people understand the important need for routine dental care, but many can’t afford to pay steep insurance prices or equally steep out-of-pocket dental costs. Because your oral health is intricately tied to your overall wellbeing, our team at Amante Dental Center has made receiving dental care much more affordable for our patients. As an alternative to traditional dental insurance, we now offer a direct dental plan (provided by Doctors Network) for patients in and around Schaumburg, IL. Rather than dealing with confusing, complicated, and costly insurance coverage, you can now enjoy substantial discounts on personalized, high-quality dental treatment. For example, routine biannual exams and cleanings at our Schaumburg dentist’s office are only $25 per visit, while the costs for fillings, crowns, dental implants, and other treatment options are discounted by up to 80%. For patients without adequate insurance, a direct dental plan can be the best way to maintain a healthy, beautiful smile. The reason for dental insurance’s inflated prices and insufficient coverage is because of the demands of third-party insurance companies. With our direct dental plan, there is no insurance middle-man, so there are no hidden-fees, surprise costs, or other unforeseen expenses for your dental care. Please note that Amante Dental Center’s direct dental plan is not dental insurance, and should not be considered as a replacement for it. If you have dental insurance, or if you want to sign up for our plan because you want to avoid insurance, then learn more about the plan by visiting http://www.doctorsnetwork.com. When you’re ready to sign up, be sure to choose Dr. Glenn Amante as your dentist. 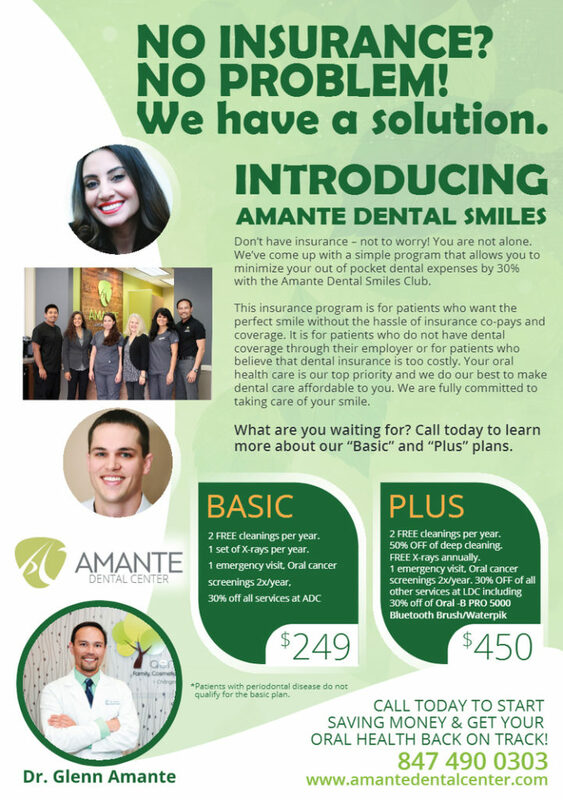 If you have further questions about signing up for the plan, or if you need assistance, then contact Dr. Amante at Amante Dental Center today, or call Doctors Network at 1-866-800-3168. At Amante Dental Center, we offer direct, discount dental plans through Doctors Network. Unlike dental insurance, a discount plan is a subscription service that allows you to pay for your treatment directly, without going through a third-party insurance company. The direct payment system means you can enjoy discounts of up to 80% or higher on the high-quality dental care that you need and deserve, from checkups and cleanings to advanced cosmetic and reconstructive restorations. To activate your discount dental plan, you only have to pay a one-time activation fee of $34.99. Your monthly subscription fee will also be $34.99, and no matter how many times you visit our dental office, or what treatments and services you require. Your subscription fees secure your enrollment in our discount dental plan, but do not cover the costs of any of your visits. However, routine preventive exams and cleanings, which are vital to maintaining a beautiful and healthy smile, are only $25 per visit under our direct dental plan. Unlike insurance, your plan will keep the costs of your checkups and cleanings the same even if Dr. Amante recommends more than two appointments a year. You can activate an individual dental plan for each member of your family for the same low, one-time activation and subscription fees of only $34.99. Typically, the costs of activating a discount plan for each member of your family is less expensive than total insurance costs for the whole family. Also, adding new members is much simpler, and there are no complicated or hidden additional costs. You can also easily switch dentists within Doctors Network if you move out of Schaumburg, or reactivate your account if you had to temporarily discontinue it due to hardship or legitimate reasons. Doctors Network was formed by a group of compassionate doctors and dentists who believe their patients deserve to receive high-quality, personalized care at reasonable costs. Because complex insurance codes and large corporations are driving factors in excessive dental health costs, Dr. Amante and his colleagues at Doctors Network are able to lower those costs by eliminating insurance companies from the equation. Doctors Network makes it possible to create deep relationships with patients, where the specifics and costs of their care are decided solely by them and their doctors. Signing up for a discount dental plan with Amante Dental Center and Doctors Network is also easier than signing up for dental insurance. Visit the Doctors Network website at https://www.doctorsnetwork.com/, and choose Dr. Glenn Amante as your dentist in Schaumburg, IL.